For a long time, many people thought chiropractors only helped patients with bad backs. What they didn't realize was that the nerves traveling down the spinal column go to every organ and cell in the entire body. When a spinal bone (vertebra) is out of alignment, it can interfere with the normal flow of life energy through nearby nerves. If the affected nerve happens to be carrying a message to the liver, the function of the liver can be altered. If the nerve is taking instructions from the brain to the heart, that organ's function may be upset. 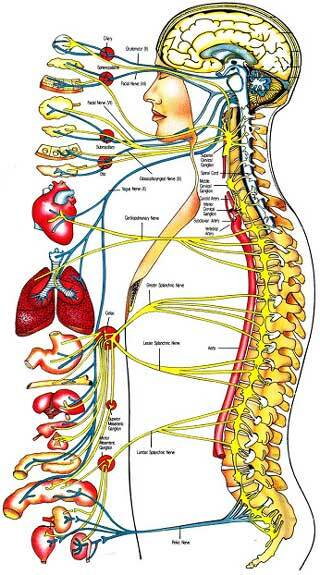 The fact is, the health of every part of the body depends on the proper flow of nerve energy. If that normal flow is interrupted or interfered with, the result is dis-ease. Some part of the body will not be able to function at peak performance. Chiropractors locate misalignments in the vertebrae, called subluxations. They use spinal adjustments to correct these subluxations. When the bones are allowed to go back to their proper positions, the nerve energy can resume its normal flow. Only then can the body continue its natural effort to maintain optimum health. When the flow of nerve energy is restored, the body is often able to heal itself. Hundreds of thousands of patients report that chiropractic helped "cure" them of headaches, sinus problems, high blood pressure, ear infections, leg pain, arthritis, and many other illnesses. Many had been suffering for years with their condition Some had tried medication or even surgery, but nothing seemed to help. That's because medication and surgery can't restore the normal functioning of a part of the body. Only the body's wisdom itself can do that. When these people went to a chiropractor, the actual cause of the problem -- the nerve interference -- was corrected. Their bodies were able to work properly and regain their healthy balance. Today, people come to chiropractors with a variety of health problems. Many leave feeling better than they have in years! But chiropractic didn't cure them. In fact, it's important to understand that chiropractors don't treat illness. They locate and correct subluxations in order to help restore the normal flow of life energy throughout the body. After the interference is eliminated, the body's own healing power takes over. Just as dis-ease is caused by interference in the normal flow of energy, health depends on having a normal flow of energy. Who needs chiropractic? Think of it this way: Who needs a normal flow of life energy in their body? People who have headaches or back pain or any other kind of illness need chiropractic. So do people who have liver problems or arthritis. So do people who feel great! In other words, everyone needs to make sure their bodies are free from subluxations and able to function at peak performance. That's why we ALL need regular chiropractic visits.